Les Écureuils (The Squirrels) and Les Hiboux (The Owls) are our holiday homes which we are happy to let when we are not staying there ourselves with family or friends. 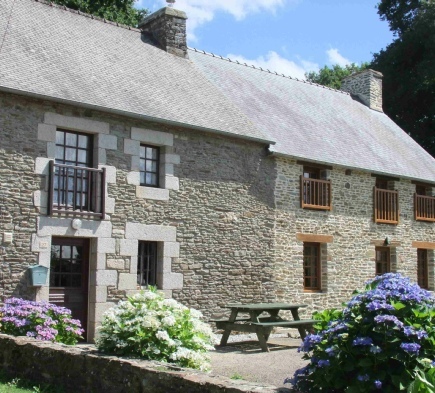 These pretty Breton cottages, part of a traditional longère, are situated in a quiet hamlet ten minutes drive from the medieval town of Josselin. Inside they are comfortably furnished in country cottage style and each has a wood-burning stove and well stocked bookcase for cosy evenings indoors. Each cottage sleeps 4 -6 people. At the back, Les Ecureuils has a covered patio and good sized garden while Les Hiboux has a patio and is surrounded by a large field. There is ample space for parking in front of both cottages. During the summer we usually offer Wednesday to Wednesday changeovers to take advantage of the cheaper mid-week ferry prices, but we can be flexible.